Cuthbert Layland Parker was born in 1887, gained 1st Class Honours at St. John's College, Oxford in 1908 in the Classics (Latin and Greek), was ordained priest in 1912 and became a Tutor at University College, Oxford, from 1912-1918. He also gained a blue and two half blues while at St. John's in Rugby, Swimming and Athletics respectively. 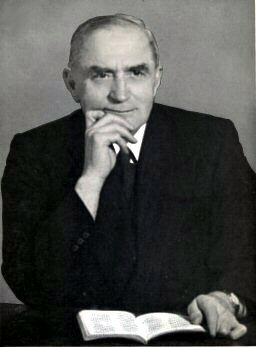 Mr Parker's varied and unusual career in the ministry meant that at one time he was General Secretary of Assemblies of God and at another was Vicar of St. James, Clerkenwell, London and Chaplain to the Royal Free Hospital when it was on Grays Inn Road. It was during his first curacy at St. Luke, Redcliffe Square, that an old lady prayed for him to be saved - it must have been a rather well to do church, more traditional than evangelical. Mr Parker used to tell how, at this time, he was sitting in the garden, smoking a pipe and reading his Greek New Testament, when the Holy Spirit illuminated the Word, and he cried out 'By gad, the Bible's true!' He then went into the pulpit and told the people he had been telling them lies thus far - and now would tell them the truth! In 1917, Mr Parker married Phyllis Harcourt Kent at St. James, Clerkenwell, of which at that time his father was vicar and of which he would become vicar 20 years later. It was during this latter period that the church experienced an outpouring of the Spirit, which must have made it one of the earliest charismatic churches of the 20th century. Returning to 1917, Mr Parker, and his wife Phyllis, quickly absorbed and entered into the fundamental truths of New Testament Christianity, such as Justification by Faith, Divine Healing, the Second Coming, etc. It was not long before he commenced his teaching ministry at various Bible Colleges (including the Bible League College and the Assemblies of God Bible College in Surrey), and also as a Convention Speaker all round the country. His style of teaching was to allow his students to ask questions as the lecture proceeded, and sometimes this would drive him back to the Word of God to search out the answers. So both he and his students grew in their understanding of the Scriptures, and there are many alive today who still remember with gratitude how his teaching revolutionised their Christian lives and their theology.